I don’t have a time machine. I don’t fly around in the TARDIS. For those of you who are not Whovians, the TARDIS stands for Time And Relative Dimensions In Space and is the space ship of the Doctor. It is an innocuous blue London Police box from the 1950’s — appearing that way because of a “chameleon” circuit that disguises the ship as a contemporary structure of the place and time it is visiting. Only, the circuit got stuck in the early 1960’s. This is NOT my TARDIS! The Doctor has been flying around the cosmos since 1963 and has been portrayed by eleven different actors — the twelfth debuting this coming fall as the “12th” Doctor. My daughter began watching “Doctor Who” about five years ago after the series was “rebooted” in 2005. She got me interested. I watched Doctor Who way back in the 1970’s when Tom Baker was the Doctor (and he is still the most popular and well known of the ‘classic’ Doctors). Soon, my entire family, with the notable exception of my wife who relies on the “Cliff Notes” version of the show, are dedicated Whovians. If you’ve followed my blog, you’ve seen and read posts in the past on this fascination. Well, I finally bit the big one and signed up for a real, live comic-con, SciFi Expo in Dallas, Texas the weekend of February 8th. My wife politely dropped me and my daughter, Casey off at the Irving Convention Center for the day. It was extremely cold and drizzling rain when Casey and I stepped into the parking garage and joined thousands of science fiction and fantasy fans. 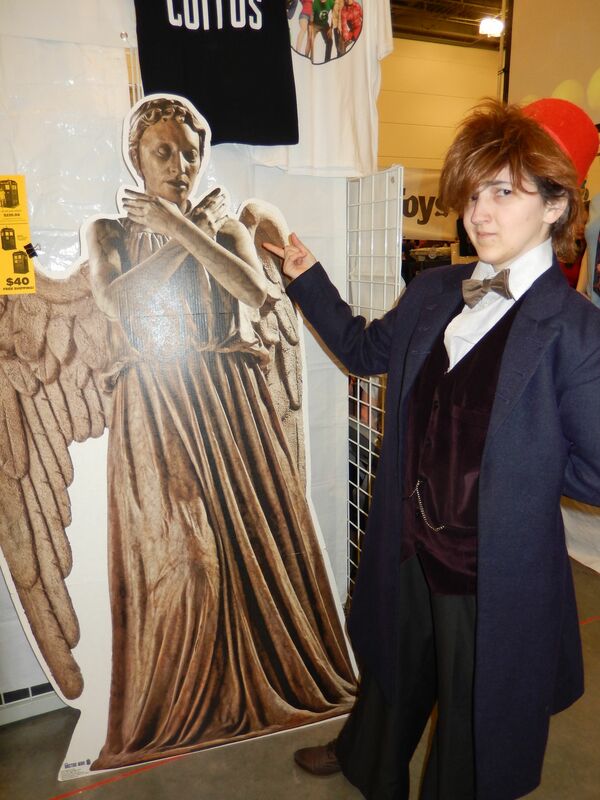 Casey was “cos playing” the eleventh doctor wearing eleven’s purple coat and topped off her wig with a red fez. I went for the War Doctor from the recent 50th anniversary special. That “Doctor” played by John Hurt was closer in age and appearance to this old f**t so I figured I could pull him off better than any of the young actors playing recent Doctors with “big hair”. I had no idea what to expect. Casey has been to a dozen or so Anime Conventions but this thing put them all to shame. It was like comparing the Death Star to the Millennium Falcon. As we rounded the corner of the Convention Hall and headed into the windy, freezing parking garage we were assaulted with the sound of a thousand souls crying out in anguish. Total, complete, chaotic bedlam followed and did not relent for the next six hours. I managed to find a convention security person in a bright orange shirt and asked him where to go to pick up our pre-ordered arm bands. His wild eyed, confused countenance did not instill great confidence. He whirled in confusion and finally pointed to a line of people snaking their way across the entire first level of the parking garage. “Get in that line.” We did. And we waited in the freezing cold for almost an hour. Just waited and stood and walked a few feet at a time. The only consolation was the gasps of surprise and wonder as fellow conventioneers recognized Casey’s purple coat (turns out she was one of only two Doctor cos-players wearing the new purple coat) and recognized me as the War Doctor. 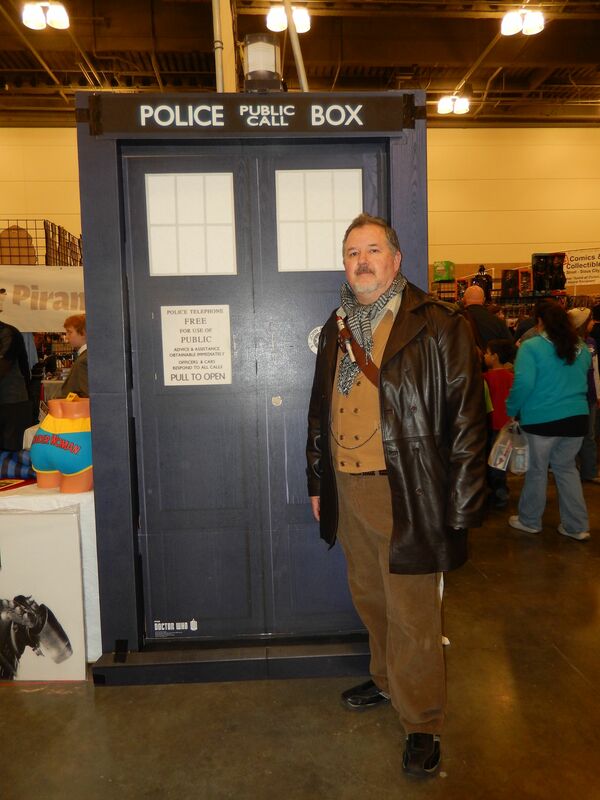 I was the ONLY War Doctor that day. And, as I learned throughout the day, many of the attendees dressed as their favorite science fiction character. 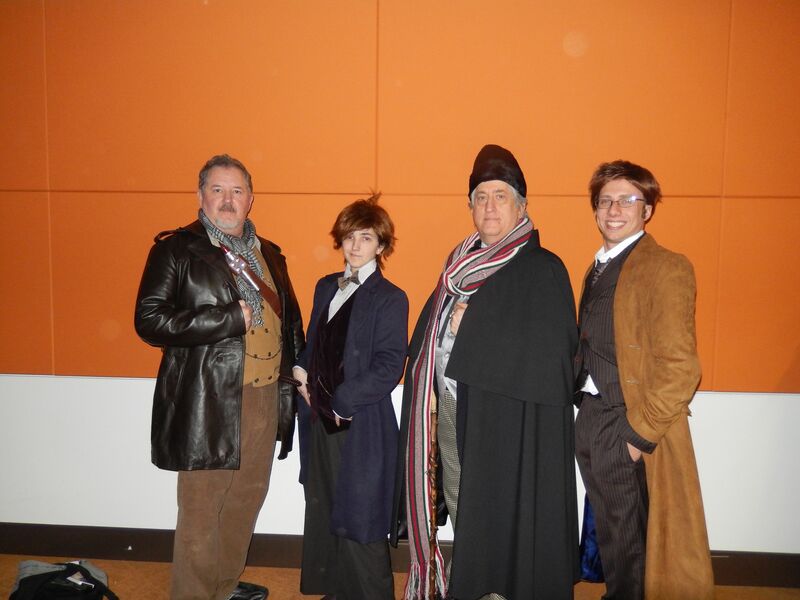 But, the vast majority of those who dressed up paid homage to Doctor Who. In all, we saw two first Doctors, several female versions of the fourth Doctor, one Fifth Doctor, one Seventh Doctor, a plethora of the Tenth Doctor and the Eleventh Doctor, but only one War Doctor. I must have been asked to pose for a hundred pictures with various characters from Doctor Who from the other Doctors to River Song to Martha Jones to K9 to girls dressed as Daleks and one young girl dressed as the TARDIS. This was the only activity we engaged in except for waiting in lines. We finally made it into the building to receive our arm bands only to exit once more to stand in the huge line on the second level of the garage — this line to enter the convention hall proper! Once inside, we were ushered into the massive merchandising portion of the convention where every conceivable product existed proudly proclaiming any one of hundreds of science fiction and fantasy story lines. It was here, we faced our second wave of picture takers. 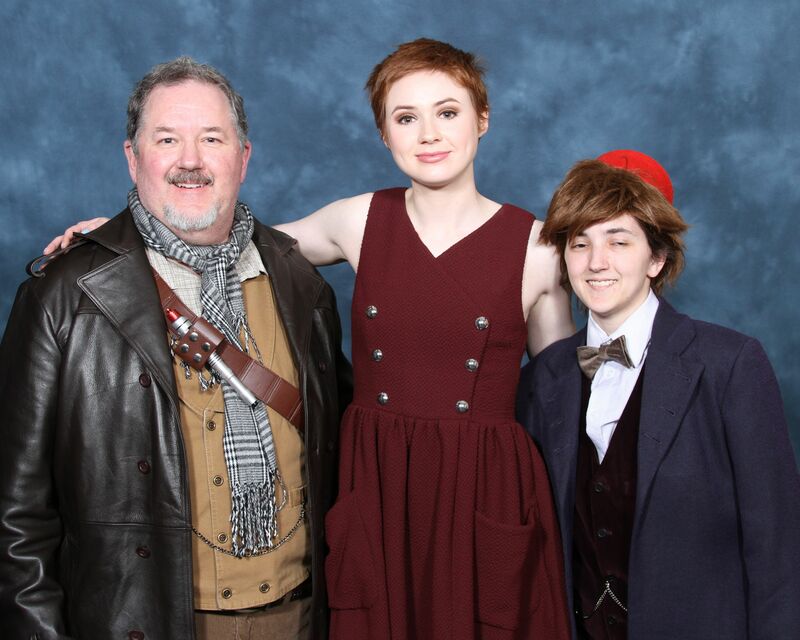 I had come for one reason only — to meet Karen Gillan, the actress who portrayed Amy Pond throughout Matt Smith’s tenure as the Eleventh Doctor. She was one of a dozen guests including Sylvester McCoy, who portrayed the Seventh Doctor and the wizard Radagast in the recent Hobbit movie. Also, Karl Urban, who portrayed one of my favorite characters, Dr. “Bones” McCoy in the Star Trek movies was there as well as Stephen Amell, the actor portraying Green Arrow on the current CW show, Arrow. I would have been happy to meet any of these people as well as Karen. However, as we soon learned, we were to have only one experience at our disposal. For, you had to wait in line to buy/pick up a ticket for a photo op with one of these celebrities. And, if you got in line for a ticket, forget making it to the Q&A sessions featuring the celebrities or getting in line to buy/pick up a ticket for an autograph from one of them. You had to choose and choose wisely. 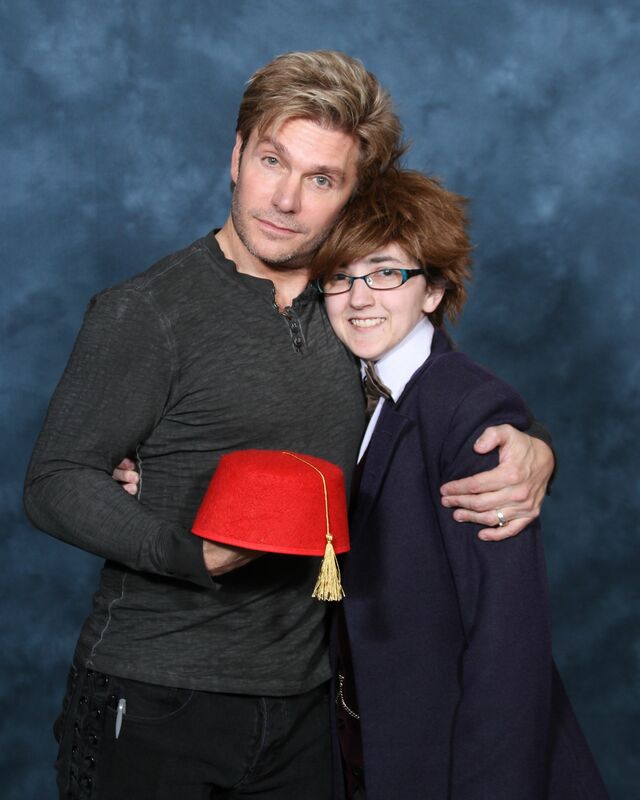 Casey also wanted to get her picture made with Vic Mignogna, a voice actor and star of “Star Trek Continues” a web based continuation of the original Star Trek. And so, after passing through the merchandise on our own for about 20 minutes we headed up the escalator to the third floor to get in line to purchase a ticket for the photo ops. Once again, we found ourselves surrounded by total complete chaos and thousands of souls wandering about this confusing universe of imagination. I sighted an Orange Shirt and he tentatively pointed at one of a half dozen lines snaking around the interior halls of the third floor. “That line. I think.” We followed the line around the maze of rooms and hallways to the end and got in line. I was immediately behind a man dressed as the First Doctor. We spent two hours with him and our fellow line waiters. During the process, we were the subject of dozens of photo ops as hapless conventioneers wandered by looking for their particular line to wait in. I glanced at my watch a dozen times. We missed the Karl Urban Q&A. And, we were about to miss the Vic Mignogna photo op. When suddenly, while waiting in a nondescript line quadrupled on itself in a room, an Orange Shirt asked if any of us wanted Vic tickets. He assured us that the line for Karen Gillan was another two hours of waiting (which overlapped with the actually op session itself). So, we resigned ourselves to getting only a picture with Vic and I raised my hand. Casey and I were ushered to the very front of this eternal line and within five minutes we had purchased her photo op. The cashier asked if I wanted another photo op. Karen Gillan? I asked. Sure! If the others waiting in line had heard us, we would have been lynched! Casey was rushed off to the Vic photo op and I held in my hand the golden ticket (actually a slightly faded cash register printout with a bar code and a pixelly picture of Karen Gillan). Casey was done in five minutes and she was the last person to get her picture with Vic. Now, here is where it was worth it all for Casey. Vic asked to hold her fez and her picture shows this incredible man hugging my daughter for the camera. He actually spoke to her for a minute and gave her his email! More on that later. We found a bench and sat down to eat some snacks I was smart enough to bring in my massive leather coat. 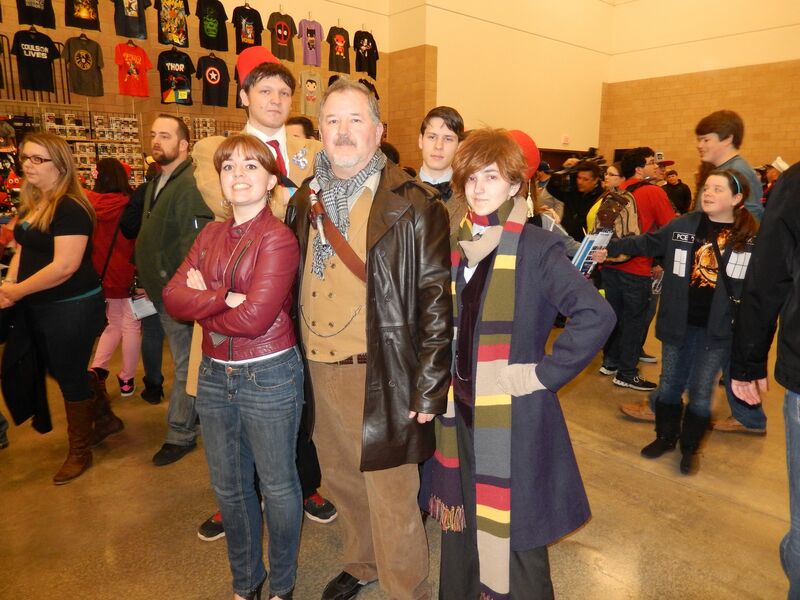 We rested for about ten minutes and then is was time to get in line to have our picture made with Karen Gillan. We made our way back into the hallways and found the end of the line of those waiting for the photo op. Here is where it was very interesting. The photo ops had sold out shortly after Casey and I got our ticket and it made no difference if you had purchased your tickets online ahead of time or at the convention. We were all in the same line! It didn’t seem that the VIP tickets made that much of a difference! An hour later, we made it into the photo op room. Soon, we were standing outside the purple curtains and just inside was the actress Karen Gillan, Amy Pond. “You’re on!” the Orange Shirt said and we rushed into the booth. Karen was standing before us and my first impression was how tall she was. In the show, she seemed short or of average height next to the very tall Matt Smith. I was surprised to have to look UP at her. Flash, our photo had been taken and we were ushered out of the booth. We spent a total of 3 seconds with Karen Gillan. I barely recall being next to her! Now, we had officially met two of the Doctor’s companions. On a train from Cardiff, Wales back to London in 2009, we met Elizabeth Sladen who played the most celebrated and best known companion of the Doctor, Sarah Jane Smith. Sadly, she passed away two years later from a sudden illness but my daughter had the opportunity to do more than just have a photo op. We spoke with Elizabeth Sladen for almost ten minutes. She was so gracious and kind. I wrote about that post in the past. Celebrity pays well if you want to pose for pictures and sign autographs. At $55 a picture and $50 an autograph, I’m sure the celebrities did very well. But, to stand there and smile and sign for hours on end? To have to hug thousands of rabid fans dressed as all kinds of strange creatures? To answer sometimes inane questions from those same fans? Maybe they deserve every penny they can earn. Then, my daughter showed me an email she had sent to Vic. 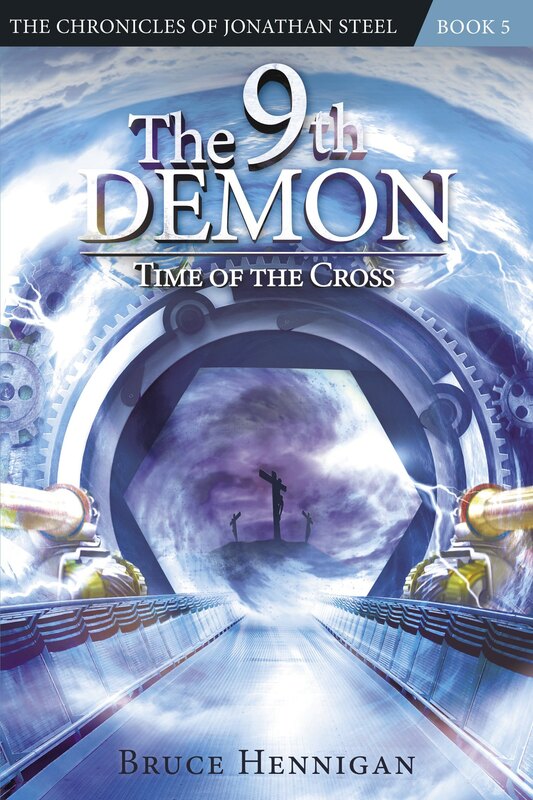 Vic is a professing Christian and Casey has met him once before at an Anime convention. She shared her life story with Vic in her email about her struggle with seizures and epilepsy and how 2013 was a horrific, but pivotal year in her life when she finally came out of the darkness into the light. She told him he was an inspiration to her. Vic could have ignored her email. Or, at best, sent a canned reply. Casey told me he read every personal email he received and he responded to Casey. He remembered her as the last person in the photo op and he recalled holding her fez. He said he was encouraged by her life story and he was grateful he had inspired her, but in reality, her story inspired him! What a class act! I know it was hard standing for hours. I know it was strange seeing so many obsessed fans, myself included, looking for something to give their lives meaning and purpose. I know it was hard to have to choose between so many good options and to fork over good, hard earned money for a single picture. But, to see the smile on my daughter’s face. To read her heart felt email and read Vic’s equally moving reply was worth every moment, every minute, every pain, every cent we spent. Thanks, Vic. And, thanks, Karen. I noticed the decrease in the noise coming from outside our airplane. We were about 45 minutes into a 2 hour flight. It was far too early for the airplane to be slowing down for its descent. Along with the change in sound level, I noticed a queasiness in my stomach. I glanced out the window at the cloud level beneath us. Perhaps it was just turbulence. We were supposed to fly over a cold front moving through Alabama toward our departure city, Atlanta. I continued to read my book and noticed the persistence of the queasiness. I am prone to motion sickness and after ten or fifteen minutes I decided there was something not quite right about the motion of our airplane. I glanced across the aisle at my wife. She was asleep as usual. I could never sleep on a flight. I don’t like flying at all. I never have. “When it’s your time to go, it doesn’t matter if you are in an airplane or not.” I’ve been told. But what if it’s the pilot’s “time to go”? My father passed away in October, 2012 at the age of 98 and he steadfastly refused to fly. Why? Because in the event of a crash he didn’t want “to wake up dead.” Hmmm! On the ground in ten minutes. Not necessarily the best choice of words! My heart skipped a few beats and I reached across the aisle and grabbed my wife’s hand. She was wide awake now having heard the entire message. We looked at each other wordlessly. What can you say? We could very well die. If the other engine failed, we became a flying brick — very little chance of gliding to a safe landing. So, we prayed. It was all I could think to do. We landed without difficulty just like any ordinary landing except for the firetrucks racing down the runway keeping pace with our airplane. We all applauded at the landing and then fell silent at the sight of men clad in silver hazmat suits waiting at the gate. We pulled up to the exit ramp and the flight attendant immediately opened the door. But, the jetway stayed retracted. Take off again? No way! I wanted OFF that airplane. It only took about 5 minutes and the jetway pulled up to the doorway. 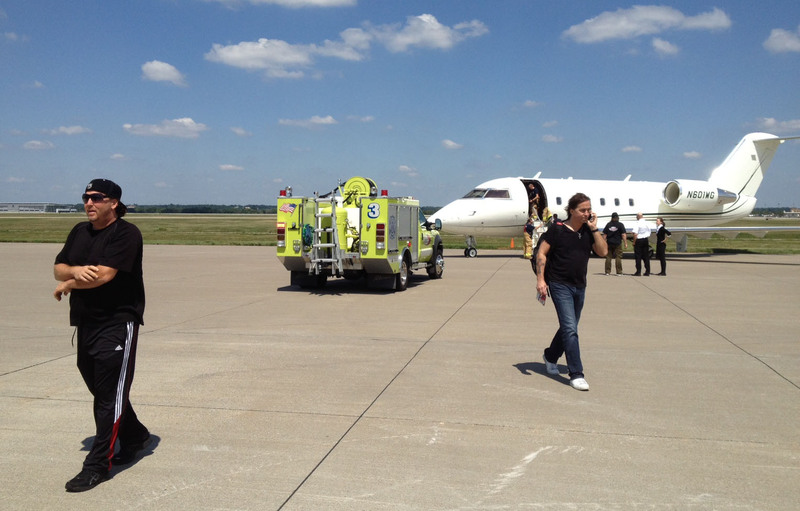 In the meantime, the flight attendant said over the intercom, “Don’t be alarmed at the fire trucks and the fire men. This is standard procedure whenever there is a engine, uh, engine, uh, malfunction.” The unspoken word was ‘fire’. She kept her cool and never uttered it. We left the airplane and hurried into the Birmingham terminal. I glanced out the window at our aircraft. The right engine looked perfectly normal — no smoke or fire. My wife and I settled into some seats to await our fate. Here is where things got very interesting. I am a people watcher. I love to see how people respond in unusual situations. What transpired over the next 4 hours did not disappoint me. The lady sitting next to me settled in beside my wife and they instantly struck up a conversation. I wandered down to the restroom to relieve myself and wash my face. It took about an hour but the decision was made that a new airplane was being flown from Atlanta to take us on to Shreveport. We landed at 130 PM and we were told the airplane would land about 320 PM. A short, dumpy man sitting next to me began to mumble. “They are liars. Consummate liars. All of them. Don’t believe a word they say. If they are breathing they’re lying!” These comments returned every time there was an announcement. Mr. Grumpy continued to spew forth his vile pessimism endlessly for four hours. Over and over, he called everyone in earshot a liar. As time passed, he added curse words to his mantra. He called up the airline on his cell phone while announcements were being made overhead to chew out some hapless airline employee on the other end of the line. I finally had to get up and walk away. Eventually we had a departure time of 4 o’clock and my wife and I and her new friend walked down the terminal to find some lunch. We settled down for an hour and my wife and her friend soon exchanged life stories. Here is my first observation. Women have an unlimited capacity for bonding together, even between total strangers. My wife and Vicky took only about 5 minutes to establish a level of friendly intimacy it would take a man and his friend to discover in a life time. Meanwhile, the men in the waiting room were either cursing or talking to their business destination about being late, or in one case, talking to a wife to make sure their life insurance was up to date. Business as usual for us, guys. No mawkish emotionalizing on our part UNLESS it was to ream out the airline for delaying our arrival at our destination. Men, we could learn a thing or two from our wives. After returning to the gate area, I was amazed as I watched three men come to the desk and request some kind of refund or remuneration for the inconvenience of our our delay. Each time, the person was told that giving out cash or vouchers was not the policy of the airline when there was an equipment malfunction. All of these men went away angry and soon our waiting area was host to “twelve angry men”. However, Mr. Grumpy still took the prize. Our new airplane landed at 4 o’clock and we had a new departure time of 4:20 PM. We would be arriving in Shreveport about 5:30 PM four hours later than our scheduled arrival time. I went to the restroom and while standing at the urinal noticed that Mr. Grumpy had arrived at the urinal next to mine. He was still complaining and cursing as he emptied his bladder. I felt sorry for his body parts — they could not walk away from his complaining. But, at least he had one inseparable friend he could complain to who would never talk back! Here is my second observation. My wife and I were on a flight from Atlanta to Shreveport when one of the two engines malfunctioned. We could have died. But, the two pilots managed to land us safely in Birmingham. Our inconvenience ended up being a four hour delay. I would say that is more than adequate payment in exchange for our lives! Instead of being grateful we were alive, some of us were demanding money in exchange for inconvenience and others were calling the people who saved our lives “liars” and other names I shall not repeat in mixed company. I leaned over to my wife and said, “Instead of complaining we should all be grateful we arrived safely without incident and we have a flight home on the same day!” Funny how things can change if you have the right attitude! We loaded up on the new airplane and settled into the same seats. My wife’s new friend sat beside me and asked if I had heard the complaints of “Mr. Grumpy”. Seemed everyone had. He was way back behind us safely belted into his seat and I felt sorry for those who were around him for the duration of our flight home. We had a new crew and the same flight attendant. 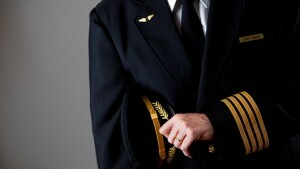 Just before boarding, I had watched the senior pilot take his bags and walk down the terminal. I wanted to run up to him and thank him for landing us safely. In retrospect, I should have. Instead, all he heard were strident voices of complaining and cursing. The man saved our lives! Here is my third observation. And, here my foundational beliefs do bias my conclusions. I recently posted on Speculative Faith and I was not received kindly by some of the commenters. One commenter said that we place too much emphasis on sharing the Truth with a capital T as Christians. That sometimes creating something of beauty is just that. Just go with it! Another commenter said my devotion to defending the truthfulness of the Christian faith was tantamount to being a “talking head”. Hmmm. Maybe all this God talk is overdoing it. Why don’t we just sit back and enjoy the ride? Let me state unequivocally that everything I believe, everything I cling to, every rational shred of intellect, every emotional feeling of pain or love comes from my absolutely unshakable conviction that there is a God who brought this universe into existence and has designed it and built it for His glory and that He has invited us to be a part of a grand and wondrous Story that is unfolding from the very beginning of time and space until the end of it all. And that God, the triune God of the Bible, can be known, can become a companion that dwells in our laughter and in our light and is always there in our darkest moments even when we choose to be Mr. Grumpy or seek some type of material compensation to salve our tortured souls. It is a sad commentary on our central pride and arrogance that it takes a terrible crisis to make us stop and examine what is real and what is truly meaningful in our lives and that is not hubris or things — rather it is people and souls and time spent in the glow of God’s created beings — our companions on this journey toward forever — that will last beyond this universe into eternity. And, when we arrive at that conclusion and we finally see dimly with God’s eyes this terrible and wonderful Plan that is unfolding around us then we find true joy and true peace. 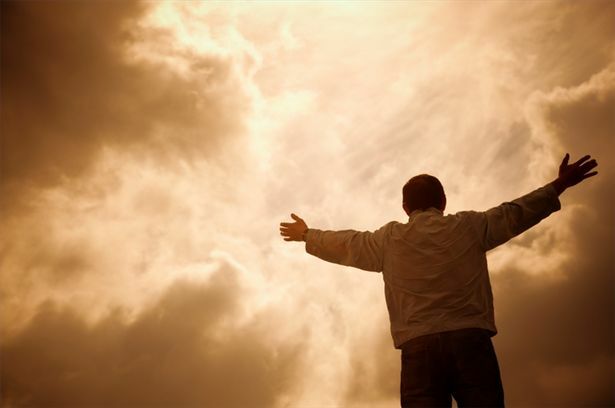 For ultimately God will show us always that He and He alone is in control. He is God and I am not. I’ve seen His job and I don’t want it! Like our stalwart pilot who walked away lonely but triumphant his ears filled with jeers and curses — God endures our grumpiness and our demands for the material and our arrogance and our ego and loves us still and continues to deliver us from the enemy. His amazing love is truly unconditional! Someone once said that faith is walking to the edge of your circle of light and taking one more step into the darkness. I disagree. Faith is knowing that beyond the failing light of our lives there is more than living and dying in the darkness — for God is there also waiting for us with an open hand to take us safely through the darkness into the ultimate Light of His love and glory. And that step we take, that hand we reach out can only happen because we have seen the evidence of His power and His plan and His love. Faith is acting upon that knowledge and being willing to put aside our own selfish point of view and see the world, the universe, eternity from God’s perspective. When we do we realize that our darkness is His light! The Mulitverse — What is it? Speculative Faith: Who’s Afraid of the Multiverse.